4 kids, a spacecraft project and Mars! Four young children of leading JPL Scientists belong to a special club called, KC or Kinetic Cadets. The Kinetic Cadets' center is located at the JPL facility, Pasadena, California. Just before the Martian Rovers, 'Spirit' and 'Opportunity' are due to complete their exploration of Mars, the students in the Kinetic Cadets are given a homework project to complete. The project demands that the students devise their own method of travel from Earth to Mars, and then use their creation to explore it in a fun and exciting way. The criteria for this project is that the craft must not only be named after a constellation, but the mode of transport must also be based on the myth, legend or idea of the chosen constellation. The children discover that, the Phoenix constellation was named after a mythical bird that believed it could rise from its own ashes. 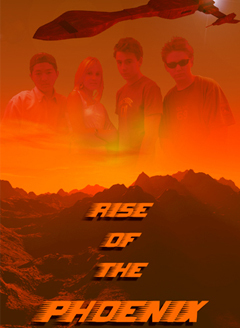 The kids decide to design a special spacecraft in the likeness of the mythical bird, naming their project, “RISE OF THE PHOENIX”. The Children take to the mocked up controls of their spacecraft and agree that each will take a turn in narrating their journey to and across Mars. During the space flight across Mars, the kids discover an underground cavern of water, as well as witnessing the polar ice caps on Mars. They go on to fly over the Martian Rovers, as the audience learn a little more about space investigations. Mission complete! Through the kid's narrative, the audience learns all about Mars and mankind's latest endeavours to explore the solar system.